It often happens that a project has an extensive list of tasks that need to be completed before delivery. Managers need to take note of this list to, in the near or distant future, divide the tasks, assigning them to the responsible parties. Such a list of a project’s tasks is called a Backlog, and instead of creating it in a shared and forgettable file, you can register everything on Runrun.it. That’s right! We just launched our new Backlog* feature. Learn more about it, including its benefits and how to use it, below. Learn how to use Runrun.it’s Backlog here! Backlogs began to be used by software development teams to organize all the steps in a product’s development. In this way, a backlog would be a kind of “drawer” within a project, used to store a list of the tasks that need to be completed. The idea is that the team assigned to the project should focus on the contents of this drawer based on established priorities as set by the team or project manager. Backlogs originally appeared in Scrum, a framework used by IT teams and created from precepts stemming from the Agile Manifesto. In this sense, the “product backlog” is the set of requirements that must be prioritized for each “sprint.” Although used systematically by engineers, the backlog concept can (and should) be used in the execution of the projects in any area – all one needs to do is organize all of the required tasks in a list. Many clients would separate some Runrun.it licenses to create users that simulated backlogs, for use as a repository of project ideas. With the implementation of the new Backlog functionality, each person’s to-do list tends to decrease, increasing work agility. Instead of a task remaining stuck in someone’s queue, it can easily be worked on by any other available team member, according to the priorities established within the Backlog itself. Have you heard of the “push” and “pull” models of work? In the first, you distribute tasks to the team according to demand, as you remember specific needs and when new ideas spring up. In this type of distribution, managers often unintentionally overload certain professionals without realizing it, because as the manager recognizes and assigns tasks, he or she often forgets to visualize the priorities of the team as a whole. 2) All those involved in a project can transfer specific tasks to themselves, making their day-to-day work more organized, with the added certainty that the right task is being worked on at the right time. The Backlog is a specific project’s task queue that members of assigned teams can execute. To compose the project’s Backlog, the user creates a new list of tasks, while assigning those tasks to a team – instead of to individuals. The button next to the responsible’s icon should be selected, and a team assigned. 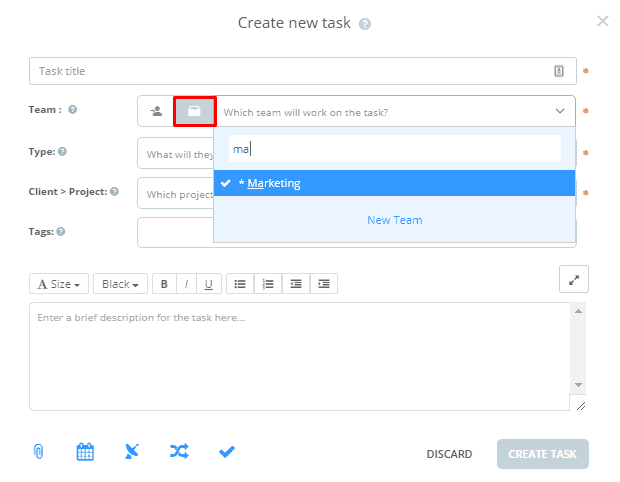 2) The task type and the selected client/project must be visible to the assigned team. This can be configured in Admin>Task types’ and Admin> Client> Project’. 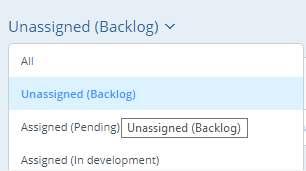 To view the tasks contained within the Backlog, go to the project page and select the “Unassigned (Backlog)” option in the table’s filter. The Backlog feature is available both for the iOS and Android mobile apps. In them, you can create a task for a Backlog, take a task from the Backlog and reprioritize Backlog tasks. 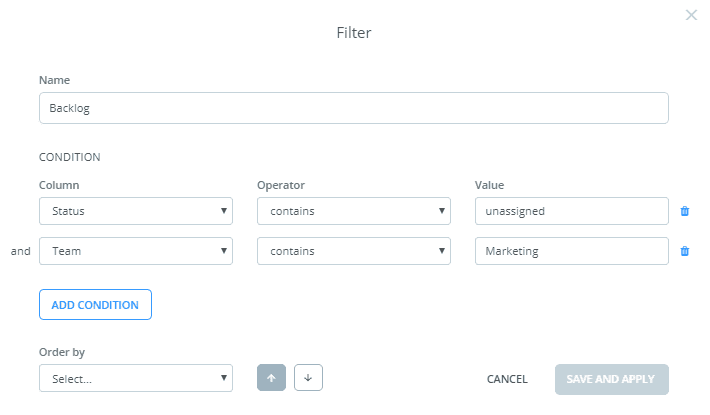 After applying the unassigned task filter to the project page, they can be prioritized by clicking on the priority and entering a new value. Only Admins, Managers, and Leaders have the permission to do this. To work on a Backlog task, just open the task details and click the “Pick up” button. * The Backlog is a feature that is only available to Corporate Plan and trial users. Do you have external or internal clients who can request tasks from your team? They can now create tasks on the Backlog by “favoriting” messages in their e-mail inbox or their conversations in Slack, or even from the “label” in their Gmail inbox. How? Using Zapier, a platform that integrates web applications.